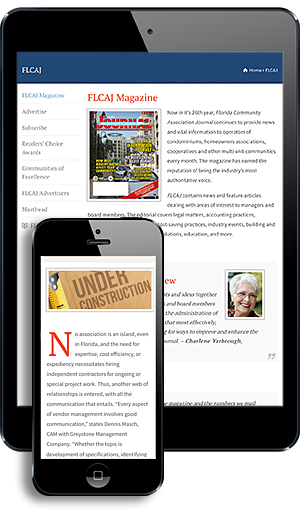 Florida Community Association Journal is excited to present a new annual feature: The Central Florida Service Guide. These service providers have proved by their track record a willingness and desire to serve community associations in the Central Florida area. We have included a brief profile of the companies and encourage our readers to learn more by visiting their websites or contacting them directly. Your community is far more than a collection of houses. Communities are families, friends, and neighbors. Vibrant and successful communities enjoy engaged and informed homeowners, equitable governance policies, prudent financial operations, and well-counseled board members who are free to focus on their role of leadership. A family-owned local business, Aegis consists of a hard-working team of dedicated community managers, in-house accountants, closing and collection agents, and maintenance and administrative staff who deliver the innovative and specialized care your community desires. It is Aegis’s philosophy that a truly productive relationship with a client partner is built first on the fundamental principles of uncompromising integrity, and then by offering highly experienced guidance and innovative, professional management service. Aegis Community Management is your resource for creating and enhancing a positive homeownership experience for both the board of directors and the members of the community. 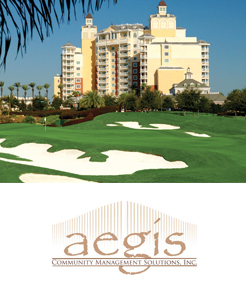 For more information, call (863) 256-5052 or visit www.aegiscms.com. 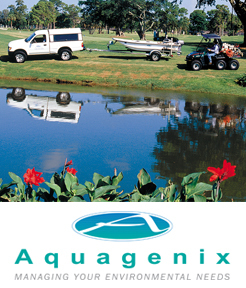 Aquagenix, a subsidiary company of DBI Services, sets the industry standard in providing a unique approach to customize and deliver aquatic vegetation management services to private, commercial, and government customers. Aquagenix has a staff of highly-trained, licensed technicians and service managers who are dedicated to providing quality service with complete customer satisfaction. Aquagenix is uniquely capable and equipped to provide customers with an integrated approach to aquatic and wetland programs. Aquagenix maintains an award-winning fleet of specialized application vehicles that allows Aquagenix to access and perform vegetation management in any aquatic environment. Services include aquatic weed control, fish stocking, fountain and aeration systems, mapping, stormwater management, water quality and clarification, and wetlands/natural areas management. Aquagenix has multiple office locations throughout Florida servicing the Southeastern United States. For more information, call (800) 832-5253 or visit www.aquagenixaquatics.com. 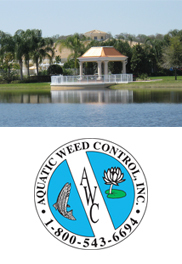 Aquatic Weed Control, Inc. (AWC) has been providing an extensive range of quality aquatic and wetland services in Florida for more than 24 years. From algae and weed control to removals and plantings, we do it all. Time is taken to develop services and solutions that fit each client’s environmental needs. We are the provider of choice for many property management companies. Other clients are HOAs; developers; environmental consultants; industrial parks; hotels; hospitals; city, county, and state agencies; and more. They have rewarded our extensive range of services with long-standing relationships. Our headquarters is in Orlando with additional locations in Tampa, Daytona Beach, and Ft. Myers. Our employees strive to meet and exceed the client’s expectations, which is why AWC is the clear choice in waterway management. For more information, call (800) 543-6694 or visit www.aquaticweed control.net. 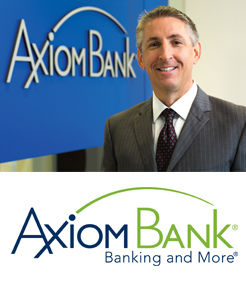 Axiom Bank, headquartered in Central Florida, is a federally chartered community bank that serves the financial needs of its customers through a wide range of financial products. Axiom Bank provides retail banking services, including checking, deposit, and money market accounts, through 20 branch locations, 19 of which are inside select Walmart Supercenters®. Axiom Bank also specializes in commercial loans for both real estate and business purposes, as well as treasury management and other merchant services. Member FDIC. Equal Housing Lender. For more information, call (321) 316-4394 or visit www.axiombanking.com. 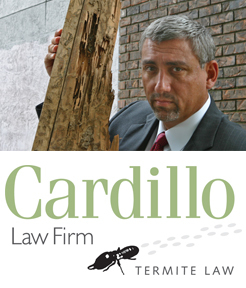 For the last 13 years, Cardillo Law, located in Tampa, has been focusing its practice on defending the rights of real estate owners, community associations, and unit owners who have experienced structural termite damage, wood decay damage due to improper termite treatment or who have been sold termite damaged property. Know your legal rights and call us! You may be able to collect from your insurance company or exterminator even if the damage is discovered years after the problems have occurred. We offer free phone consultation. For more information, call (877) 642-2873 or visit www.cardillolaw.com. 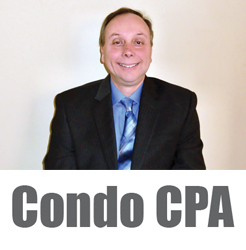 CondoCPA, Inc. is your solution for community association auditing, monthly accounting, and taxation services. We work exclusively with community associations, including condominiums, HOAs, townhomes, villas, and coops, providing audits, reviews, compilations, tax return preparation, tax and financial planning, monthly bookkeeping, and much more for approximately 500 associations. We work with all sizes of associations—small, medium, and large—tailoring our services to meet each association’s unique needs and budgets as well as implementing solutions to issues that are unique to community associations. We have locations in Tampa, Sarasota, and Orlando. For more information about CondoCPA and our services or to obtain a free quote, visit our website at www.condocpa.com or call (877) 900-1040. Elite Property Management Services is pleased to have the opportunity to introduce our company and services. Our team of certified managers, assistant managers, and administrators are dedicated to providing the highest quality service while catering to the unique needs of each individual community. We offer complete servicing in administration, financial management through David Ormiston, CPA, and property maintenance and have implemented the latest technological advances in the management industry. We work with a team of attorneys that help solve the complex issues presented in today’s communities. When you select Elite Property Management Services, you select an entire team that is dedicated to serving the needs of your association. For more information, call (727) 400-6850 or visit www.elitepms.com. 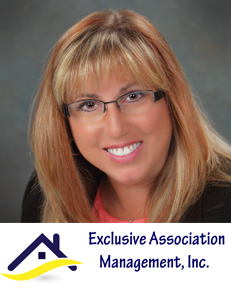 Established in 2005 in Georgia and expanded to Florida in 2012, Exclusive Association Management Inc. has brought a different approach to community association management. Our vision is to establish education in our industry to board members, homeowners, and vendors alike. We take the time necessary, no matter how long it takes, to create a firm foundation. The foundation created then builds encouragement and pillars of strength for the community as a whole. The board members feel empowered and certain with the decisions they make. Our goal is to help put the unity in your community! For more information, call (386) 492-8066 or visit www.exclusiveassocmgmt.com. 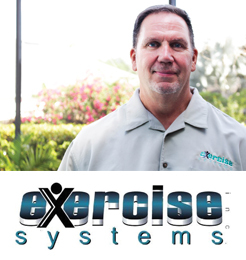 Founded by John Young in 2000, Exercise Systems, Inc. offers quality commercial fitness equipment to satisfy all your fitness facility needs. Our business was built on customer service with a long list of loyal, satisfied customers. We employ our own staff of factory-trained service technicians who handle all warranty and maintenance work. We carry higher liability limits and are a certified vendor for most property management companies. Our warehouse and showroom facility is in southwest Orlando at 6881 Kingspointe Parkway, Suite 10, where you can view and demo an extensive array of cardio and strength pieces. We offer a turn-key approach to facility planning and equipment purchase and installation, with a personal touch on every aspect of your transaction. Our strength as a company is evident both prior to and after the sale. For more information, call (407) 996-8890 or toll free (877) 370-0220) or visit www.exercisesystems.com. While Florida Community Bank (FCB) is one of the largest, independent banks in the state with assets of more than $7.5 billion, our primary focus was, is, and always will be to serve the diverse Florida communities we call home. FCB offers depository/treasury management services designed for condominium, community, and homeowners associations. FCB currently manages more than 2,000 association relationships with five lockbox locations within the state of Florida. As a “Florida-based, Florida-focused” bank, FCB has convenient locations in Brevard, Broward, Charlotte, Collier, Hendry, Hernando, Hillsborough, Indian River, Lee, Martin, Miami-Dade, Orange, Palm Beach, Sarasota, Seminole, St. Lucie, and Volusia Counties. Equal Housing Lender, Member FDIC. For more information, call Kathleen Karpovich, SVP/Deposit Sales Director at (239) 552-1759 or visit www.FloridaCommunityBank.com/Associations. 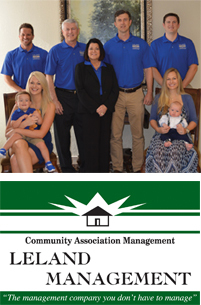 Leland Management is a leading community association management firm that has been managing Florida condominium and homeowner associations for more than 15 years. We have 15 offices located throughout Florida and currently manage more than 400 associations ranging in size from less than 50 homes to approximately 4,000 homes. Leland is a full service management company with seasoned professionals who pride themselves in providing the best quality service to the communities they serve. We have more than 75 licensed community association managers who average more than seven years of experience, giving the company more than 500 years of total manager experience. Our managers carry numerous advanced professional designations, and we have an effective system for sharing this expertise within the company and with our communities. For more information, call (888) 255-8577 or visit www.LelandManagement.com. As an industry leader in product development and product enhancement, Pecora is committed to offering a full range of adhesive, sealant, and weatherproofing solutions. Our focus is directed toward the continuous innovation of value–added products, superior quality, and exceptional service. Founded in 1862, Pecora Corporation® is an American manufacturer of architectural weatherproofing products offering a full line of sealants, air barriers, and traffic coatings. Pecora products are specifically formulated to provide superior quality and a wide range of sealant properties for the commercial construction and OEM (original equipment manufacturing) markets. Pecora products are available through authorized weatherproofing distributors throughout the United States. For more information, call (800) 523-6688 or visit www.pecora.com. RealManage Tampa is a full-service HOA/condominium management office with all the technological advantages you need along with the hands-on approach you want. Communication is our top priority. We understand the importance of getting an answer when you need it, and we deliver the personal management touch your community deserves. In addition to our personal touch approach, our boards have access to the association information at the touch of their fingertips. 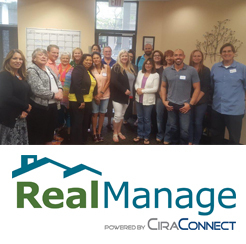 With RealManage, you are working with a management team that is right here in Tampa. Contact us today to learn how we can make your life on the board easier and more effective. For more information, call (866) 403-1588 or visit www.realmanage.com. Founded in 1957, Rick Carroll Insurance is a full-service agency comprised of commercial, group benefits, and personal insurance. We are a team of dedicated professionals providing clients with a superior level of customer service separating us from our competitors. Accessibility, promptness, and accuracy are qualities we strive for each day. To meet these goals, we have a live operator, no automated attendants; we utilize state-of-the-art technology; and e-mails and phone inquiries are responded to quickly. Our staff maintains current knowledge through frequent training and attendance of continuing education courses. We have developed the expertise required to understand and handle the cyclical nature of the insurance marketplace and utilize a consultative approach to provide a solutions based insurance program that meets your needs. For more information, call (772) 334-3181 or visit www.rickcarroll.com. Sentry Management celebrated 40 years in business in October 2015. We have grown to be one of the largest homeowners association and condominium management firms in the U.S. with headquarters in Florida. Sentry exclusively focuses on managing communities, homeowner associations, and condominiums. With 15 Florida offices, Sentry is a major presence in the state. Sentry is an Accredited Management Organization (AMO®)—an assurance of integrity and expert financial systems. Only the top six percent of U.S. management companies earn this prestigious designation and only a handful of association management firms. Sentry has no ownership or affiliation with any HOA or condominium contractors or suppliers. We always negotiate the best prices for each community we manage, and the savings come back in the form of lower operating costs to residents. Integrity and transparency are part of our DNA. Planning and coordination of association meetings, site visits, enforcement of deed restrictions, contract supervision, and aggressive collection of assessments are all regular services, along with detailed financial and manager’s reports. Sentry invests heavily in technology and tools to help communities prosper. 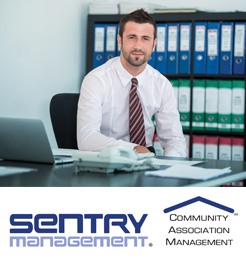 CommunityPro® is Sentry’s exclusive management and communications software. It makes the community manager more productive and board members better informed. CommunityPro® PORTAL is the free password-protected website available to every community. All the CommunityPro® technology, online payment acceptance, and real-time online financial and management reports are standard. Florida offices in Brevard County—Space Coast, Clermont, Fort Myers, Kissimmee, Longwood—Orlando, Naples, Pasco County—Tampa North, Ponte Vedra—Jacksonville, Sarasota, Tampa Bay—Clearwater, Tavares—Ocala, and Volusia County—New Smyrna Beach. For more information, call (800) 932-6636 or visit www.sentrymgt.com. 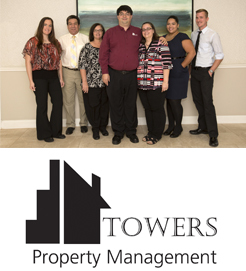 Towers Property Management is owned by Benjamin Isip, CMCA, AMS, and President; and Emily Towers Isip, CMCA, AMS, and Vice President. They serve associations in Orange, Seminole, and Osceola counties. Towers Property Management provides full-service management for homeowners associations, condominiums, and townhome communities. For the self-managed community, they offer consulting and bookkeeping services. They believe that every community deserves professional management, if they desire it, regardless of the community’s size. Their mission is to provide association clients with professional, personal customer service; experience and access to resources; and the support needed to help them reach their strategic goals. Towers’ goal is to provide personal service beyond expectations in a climate of excellence and quality. For more information, call (407) 730-9872 or visit www.towerspropertymgmt.com. When you need a commercial landscaping partner, it’s hard to know where to start. 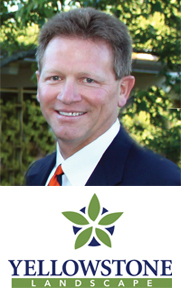 Yellowstone Landscape, which has been in business for 22 years and is headed up by Tim Portland, CEO, is a commercial landscaping firm with a proven track record of creating and maintaining beautiful landscapes for communities of all sizes. They understand that landscaping is just one of a hundred other things you’re responsible for. Their focus on proactive communication frees you to focus your attention to managing all the other needs of your community. Yellowstone believes you deserve a partner to help you be proud of your landscape. Yellowstone Landscape is one of the leading commercial landscaping companies in the country, with locations across Florida. Their services for community associations include comprehensive landscape maintenance programs, landscape design and installation, and irrigation installation and maintenance. Get started with Yellowstone Landscape today. For more information, call (877) 785-6685 or visit www.yellowstonelandscape.com.